Multiple Retirement Accounts - Think Outside the 401k Box. When you start withdrawing from your 401(K), you’ll have to pay taxes on those withdrawals. It’s possible that you might be in a higher tax bracket when you retire than you are in today. Unfortunately, there is no way to predict what the tax climate will be when you retire. Spreading your savings across many types of accounts – both taxable and non-taxable gives you flexibility in combining more streams of income. This also gives you more pliancy in your retirement to minimize taxes and maximize your income. Relying solely on a 401(K) gives you limited access to your money in case of emergency. If you are under age 59 ½, you face stiff taxes and penalties for accessing your nest egg outside of retirement income. How about Fixed Index Annuities? These annuities offer a guaranteed rate of interest over a fixed number of years and have additional interest that might be credited based on percentage changes in values of broad market indexes. This interest is calculated using a specific formula that determines how much of the percentage changes applies to the value of the account. For instance, if a Fixed Asset Annuity has a participation rate of 50% and a return of 10% in a policy year, 5% is credited to the account. 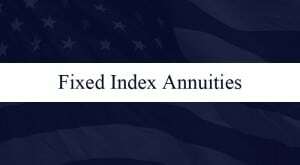 Fixed Index Annuities offer guaranteed lifetime withdrawal benefits making them useful for saving in retirement and for income during retirement. Fixed Index Annuities offer full protection of your principal with permanently locked index gains. They can potentially provide better rates than CDs and are an efficient way to contractually plan for any future income needs. They might even provide supplements to traditional long-term care coverage. These tax-favored products’ annual growth is benchmarked by stock market indexes rather than interest rates. Since their growth ties into rate floors and caps, it will not exceed or fall below specified return levels – even with stock fluctuations. You cannot lose your principal with these annuities and your potential annual gains may be between 3-9%. You will gain compounded earnings and defer income taxes with no filing of annual 1099 forms and no marking of earned-interest entries on your 1040. If you have maxed out your 401(K), you can still contribute without limit to a tax-deferred annuity. Annuity contracts offer annually renewing rates and the possibility of higher cap or participation rates, so your principal and earnings are protected no matter what direction interest rates take. With today’s longer life-expectancy rates, retirees who are concerned about outliving their investments can protect themselves by creating a guaranteed lifetime income stream. Annuitizing an IRA gives you the opportunity to exchange its value for an immediate income stream in several different forms. You can receive a monthly check guaranteed to stay constant over your lifetime. Another asset is a probate-free inheritance. You can avoid this time-consuming and expensive experience for your heirs by purchasing annuities. Named beneficiaries are paid directly and promptly as soon as your insurance company is notified of your passing. Many annuities offer premium bonuses. These are credited to your annuity when premiums are added and can range between 4-12% depending on the annuity’s duration. You do need to be aware that these premiums can come with lower cap and participation rates than those without bonuses. Some bonuses are paid only if you annuitize with that company at a future date. If you choose to withdraw your money in a lump sum before the surrender fee is over, the insurer may retroactively remove a portion of your premium bonus. When you purchase a Fixed Index Annuity, there are typically no upfront sales charges (unless you purchase optional riders for added benefits) and usually no maintenance fees so 100% of your premium goes directly to work for you. Fees are applied if you surrender the annuity early. You can, however, withdraw earned interest without triggering a surrender fee. These may be up to 10% of your account value each year after the first year. These penalties should not be confused with the 10% early withdrawal penalty the IRS imposes before age 59 ½. When your Fixed Index Annuity is no longer subject to surrender penalties you can reinvest your money with the same company at the current rate or switch your account to another insurer or simply withdraw your money in a lump sum – but this means you will owe federal income tax on ALL the earnings in that single year. There is an additional 10% penalty if you’re under age 59 ½ at the time of withdrawal. You can postpone this tax bite and still turn your annuity into a reliable income stream. You can do this by annuitizing your policy into an immediate annuity. Settlement rates are the current guaranteed purchase rate per $1,000 of account value. These rates move up and down in conjunction with the interest rate fluctuations in bond markets. If you find better rates, you can transfer your account balance. There are tax advantages to this, such as postponing paying taxes on some earnings but this is an irrevocable transaction meaning that once established it cannot be cashed in or even reversed. You might also want to consider Life Insurance policies that build equity. These “cash value” policies can provide a source of income that you can use to help supplement your retirement income. You definitely want to consult with a financial planner before going ahead with any options. The more options you give yourself, the better off you will be in retirement. You’ve heard the old saying, ‘Don’t put all your eggs in one basket,’ well, the same holds true for your financial future. Don’t put all your money in one retirement account. You need the financial flexibility of both taxable and non-taxable income to make the most of your retirement earnings.